If “heritage” and “authenticity” are what motorcycles are all about going forward, then no company is better equipped to prosper than Royal Enfield. The company’s roots date back to the 19th century, and its Bullet—whose engine the new Continental GT is based upon—was first produced in 1933. That makes the Bullet the oldest motorcycle in the world in continuous production. In 1967, RE shuttered its plant in Redditch, England. But by then, its subsidiary in India had already been stamping out Bullets for years, for use not only by the Indian police and military, but for upscale civilians as well. In India, where there are millions of 125 and 250cc bikes providing transportation for 1.2 billion inhabitants, the Bullet in 350 and 500cc sizes is an aspirational motorcycle. Harley-Davidson in the U.S. has nothing on RE in India, which claims 95 percent of the over-250cc home market. That number is aided by a 60-percent tariff on imported motorcycles that pushes bikes like the 883 Sportster and Honda CBR600RR into the realm of exotica—and which has led H-D and others to open their own Indian plants in recent years. The rise of the Indian middle class has driven demand for its bikes through the roof lately, says Siddhartha Lal, Managing Director and CEO of Eicher Motors Ltd., Royal Enfield’s parent company. In 2010, Lal says, RE sold 50,000 motorcycles. By 2012, the number had doubled to 100,000—which led to the building of a new state-of-the-art factory near Madras, which just came on line in April. This Oragadam plant has a production capacity of 175,000 bikes for 2013—and gives RE the ability to scale up to 500,000 per year. Lal, it should be noted, also serves as Chairman of Eicher Polaris Private Limited, which ties Royal Enfield to our homegrown Polaris. Yes, someday there very well could be an Indian Indian. With all that going on, it seemed like a good time to come out with a truly new Royal Enfield, carrying forward no parts from the original Bullet. Okay, almost no parts: Bolted solidly in four places in the Continental GT’s engine bay is the same old unit-construction EFI Bullet Single, punched out to 535cc (87.0 x 90.0mm) and now powering a lovely little Continental GT with a steel frame designed by Harris Performance, beautiful new bodywork courtesy of Xenophya Design (both U.K. companies), brakes from Brembo, alloy Excel rims with fat spokes, Paioli shocks, 41mm fork tubes and all the right “café racer” design elements. The red paint, thanks to the new paint shop in the new factory, looks very nice, though the silver metalflake applied to the triple-clamps and fork sliders isn’t exactly period correct. If revenge (following 300 years of colonialism) is a dish best served cold, what better place to introduce your new Indian-built British classic than London? Hit the starter (or kick the kickstarter) and the air-cooled, fuel-injected thumper mumbles to life more than rumbles, even with the louder accessory exhaust our test bike is wearing. Injection mapping isn’t great; there’s a dead spot off idle that requires a few revs to bypass when leaving from a stop (sometimes it flames out anyway), but once rolling, there’s good torque down around 2000 to 3000 rpm, enough so that second gear feels just as strong as first. RE claims 32 foot-pounds at 4000 rpm. Horsepower maxes out at 29.1 at 5100 rpm according to RE’s specs (which seems about right), and past that, the tachometer needle is in no hurry to get to the cut-out at 5500 rpm. For sure, this bike’s not about horsepower—but the difference between the Conti’s claimed 29 and the 38 or so put out by the Guzzi V7 Racer we tested last year, feels huge. 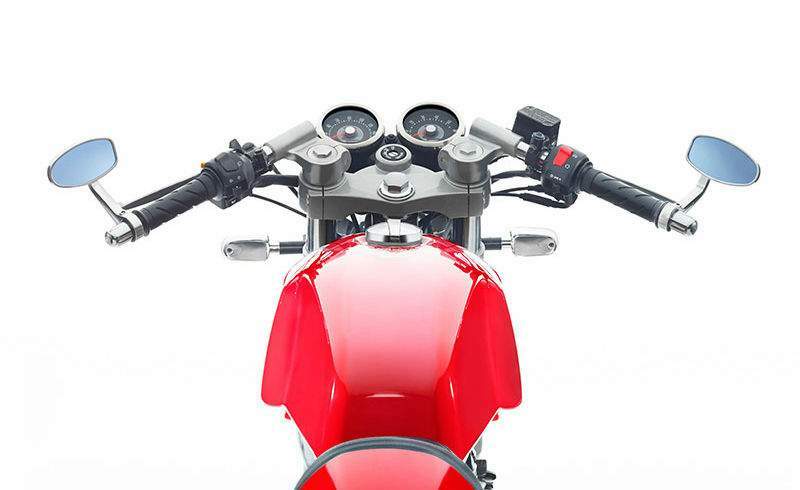 Compared to its target, the Triumph Thruxton, the Conti GT makes about half the power and weighs more than 80 pounds less, if RE’s claimed dry weight of 387 lb. is accurate. The GT could probably rule a tight downhill set of curves on its Pirelli Demons, but purely from a functional standpoint it feels like a lovable antique when compared to the 337-lb., 68-hp KTM 690 Duke. Eureka! Reliable modern bikes that look like antiques are just what many doctors are ordering lately—to be transported to a happy, simpler time without the need to bring tools. 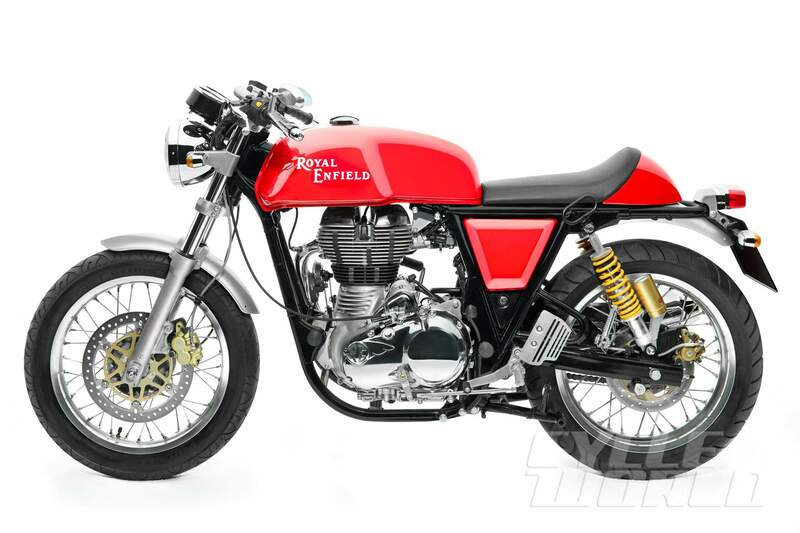 Hats off to Royal Enfield for producing a bike that will appeal to mature riders while still being affordable enough, at around $7200, to get the attention of hipsters. If you’re okay with the engine, the rest of the Continental GT is more friendly to ride than it looks. Nicely compliant suspension feels just about right for my 155-pound body; the seat is thick and comfy if pretty narrow; the rear of the tank is a good shape; and those clip-ons are mounted on top of the triple-clamps so you’re left with a near-standard riding position. The five-speed gearbox works fine, and the disc brakes are powerful enough—but there’s no lever adjustment for the front so you had better hope it fits your hand. 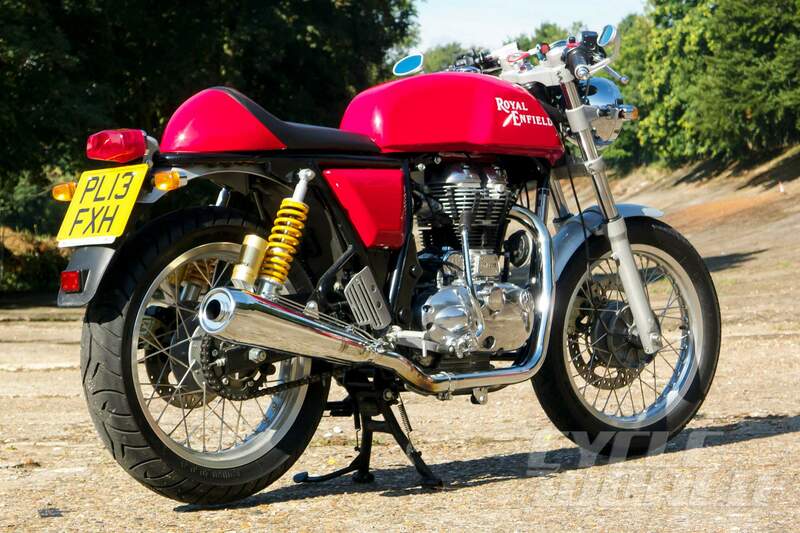 The rest of the controls and switchgear are also not quite up to current Japanese tactility, but they’re close—and with a few minor adjustments to take the play out of the throttle, etc., the Royal Enfield Continental GT could be tailored into a sweet little runabout. 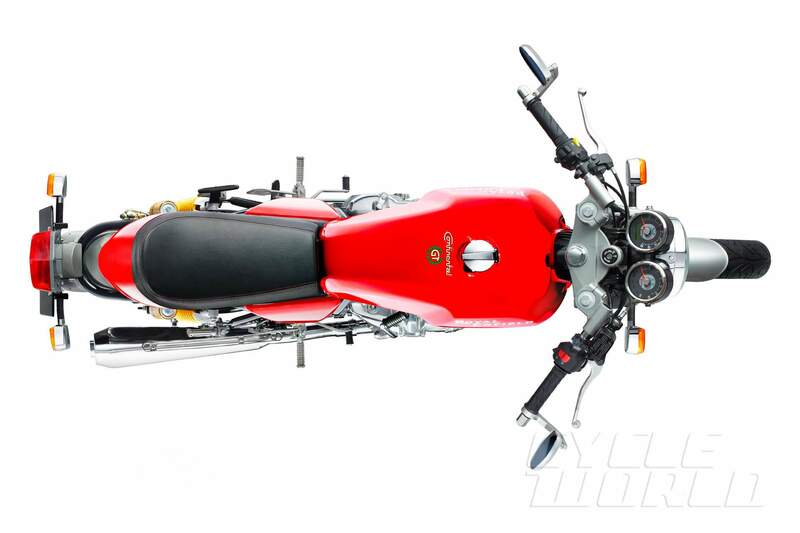 However it works and sells, the GT is a hugely significant motorcycle. Whether it captures American hearts and minds is beside the point: If these don’t sell well in the U.S., there’s a long list in India that’ll gladly pay a quarter the cost of a Sportster all day long for a sporty Continental GT. And Siddhartha Lal also sees it as a viable mid-level motorcycle for South America, where countries like Brazil are busting out as fast as India. (In addition to his role with Eicher, Lal is also involved with the World Economic Forum’s “Transforming Urban Mobility” initiative. It’s not always about us First Worlders.) 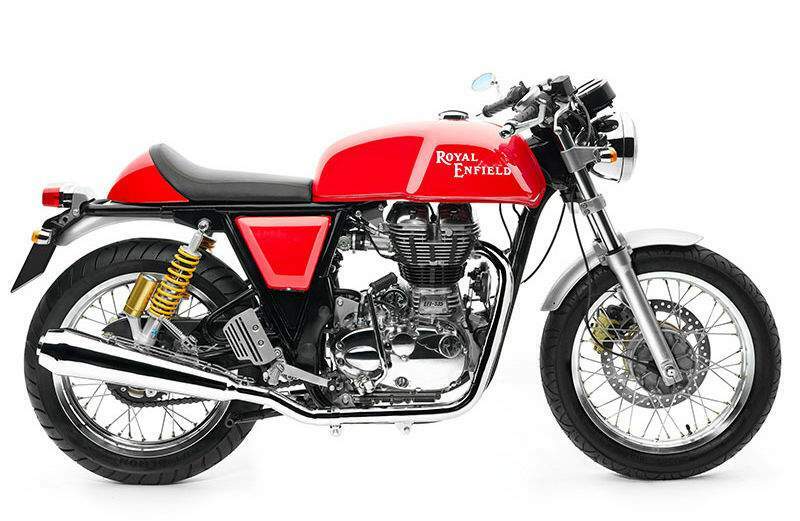 Meanwhile, flush with cash and full of confidence, Royal Enfield’s got 500 people working on new projects. If they’re as motivated as the people it sent to launch the Continental GT in London, the motorcycle world had better watch out.